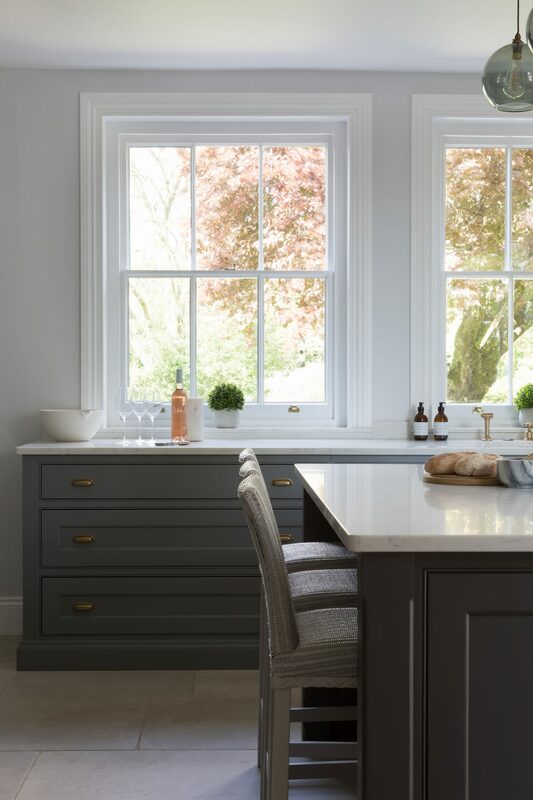 When you walk into this kitchen the first thing you notice is the cool and calm colour palette and the big Georgian windows looking out across the gardens. 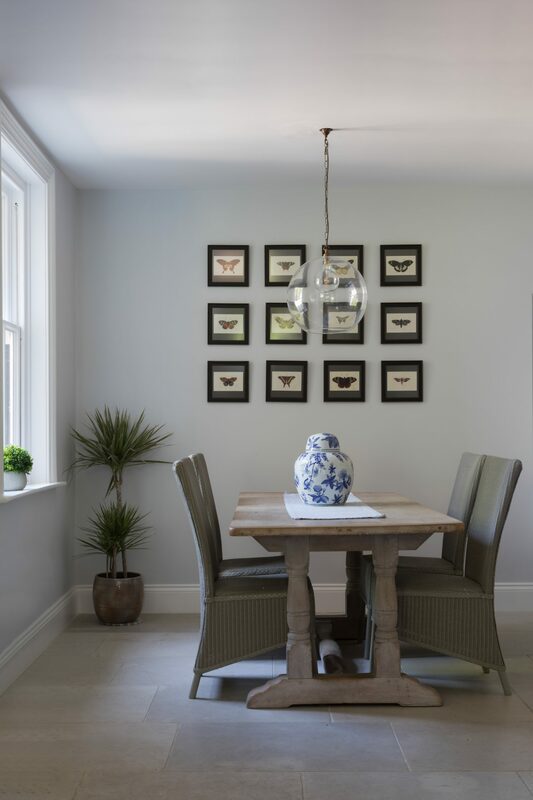 The Old Vicarage project is in a pretty English village and has that perfect rambling feeling that is so typical of Georgian country houses – lots of character and lots of life in this happy family home. 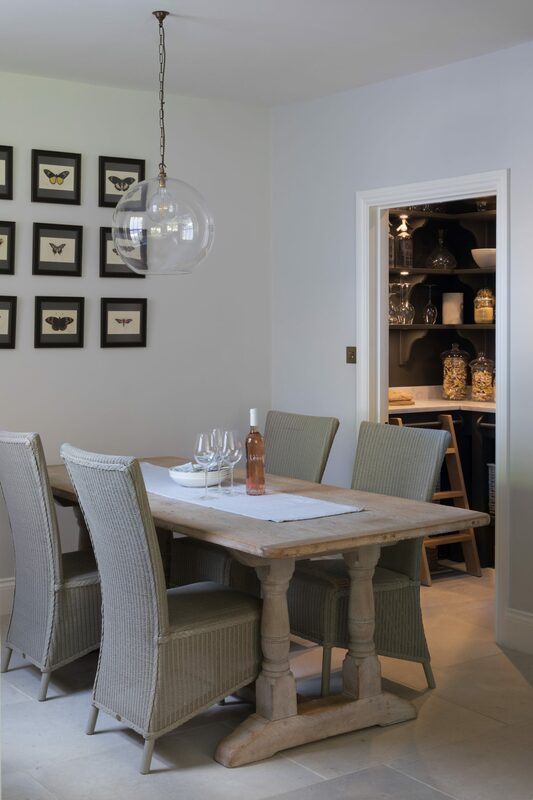 We worked with the clients to design the open plan kitchen and dining area, a walk in pantry and the utility/ boot room which offers the main access route into the kitchen via the back door. In the image above that’s the door to the right hand side, but you can also access the kitchen from the more formal side of the house where the main sitting room and living spaces are located. 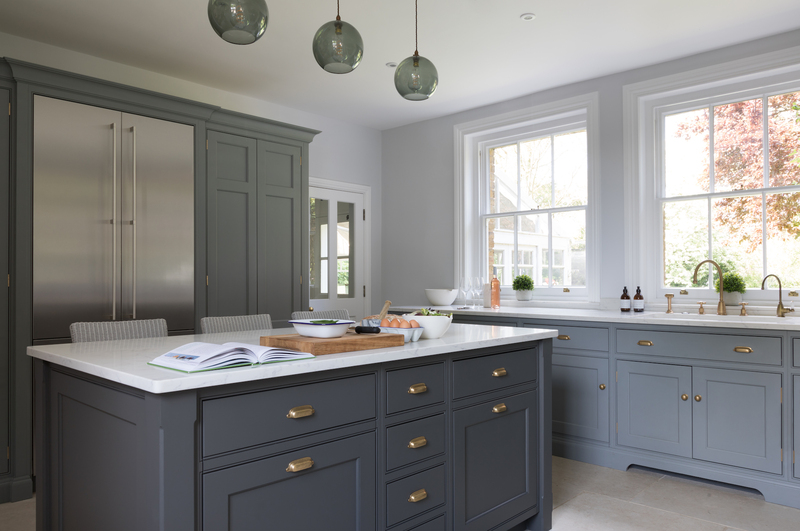 The Nickleby cabinetry was chosen by the clients for its classic English style, and is painted in H|M’s own colour palette design exclusively in collaboration with Mylands. The perimeter cabinetry in the kitchen and utility / boot room is painted in Windward, while the island and walk in pantry are painted in Top Hat. 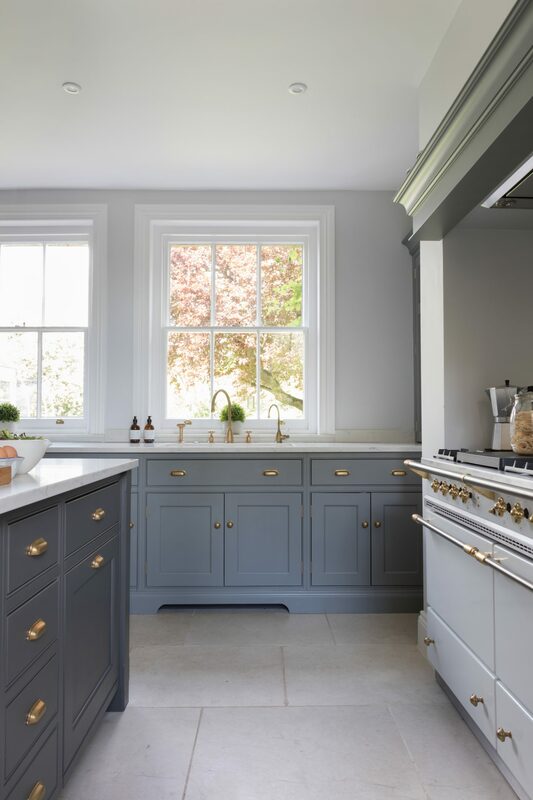 All the hardware – granger pull handles and fielding knobs – is finished in aged brass as a nod to the Georgian heritage of the property. As always, the zoning of the kitchen was the critical starting point: ‘Zoning this space was the key to the design, and really ensured the success of the open plan kitchen / dining area. 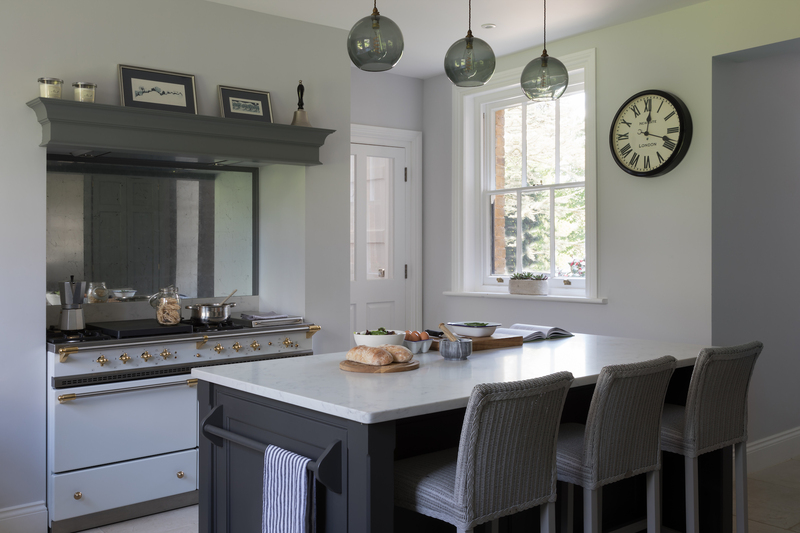 The Lacanche range cooker is housed within the existing chimney so an island opposite offers up countertop space for food preparation with seating on the opposite side for breakfast time. Incorporating a countertop cupboard between the sink run and the Lacanche provides the perfect spot for tea and coffee making as the hot water tap is just nearby and the integrated under-counter Gaggenau refrigerator on the island means milk is always to hand“; says Peter Humphrey. As keen cooks, the clients opted immediately to include a Classic Lacanche Chalonnais range cooker that would be positioned within the existing chimney and allows the Westin extraction to be hidden from view. Finishing this original chimney with a contemporary overmantel allowed this area to become the main focal point of the kitchen. This Lacanche Chalonnais model has four gas burners, a simmer plate and an electric plancha making it the perfect multi-purpose range cooker. This workhorse of the kitchen was not just chosen for its reliability and versatility, but also for its beauty; this Lacanche Chalonnais has such a traditional look and is finished in white enamel with a brass trim that will weather with age. This is a real family kitchen with lots of weekend entertaining – not in a formal way, more relaxed and low key – so the kitchen and dining area were really designed with ease of use in mind. 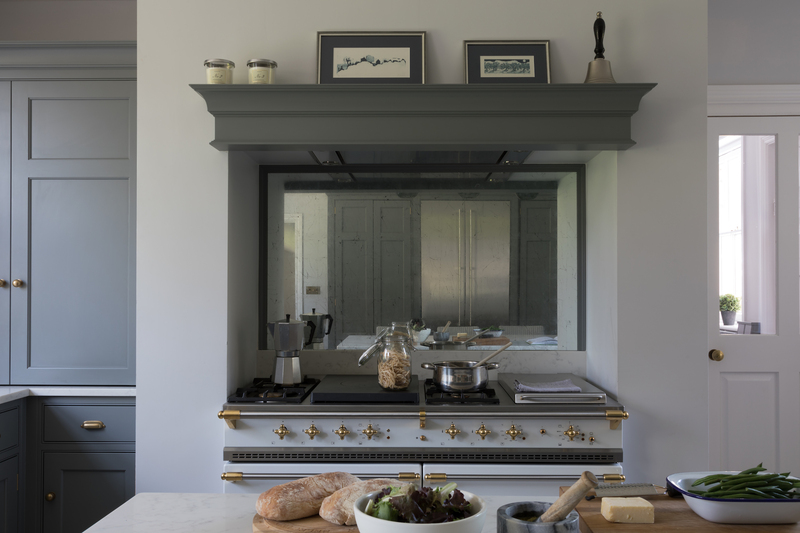 The finishing design detail to this cooking area is the antique mirror splashback positioned behind the range cooker. 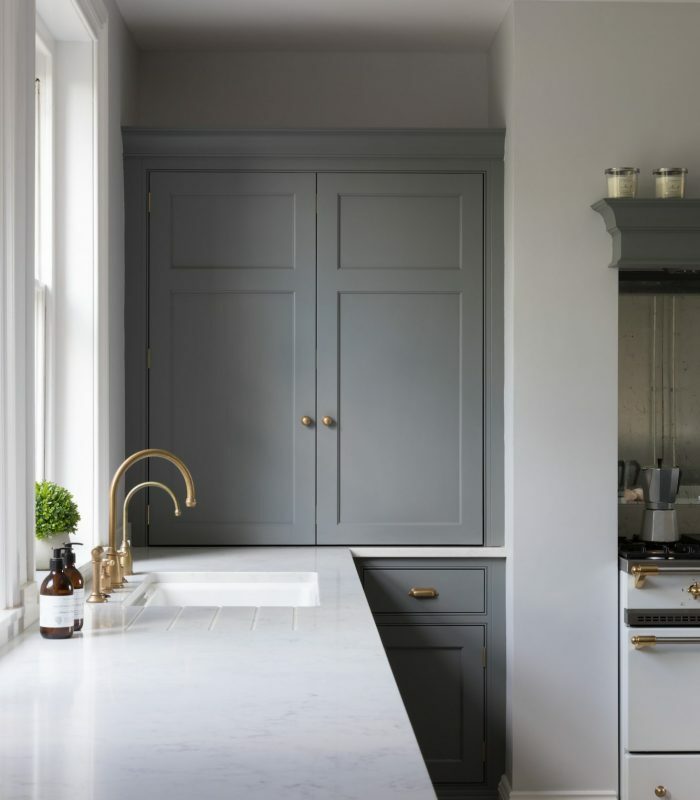 Easy to clean and maintain, this robust and specially toughened splashback bounces the light back across the room and is finished with a painted trim. Directly across from the Lacanche range cooker is the bespoke kitchen island which not only serves as the main preparation area but also provides additional storage concealing a pull-out compartmentalised bin, Gaggenau under-counter refrigerator, a set of four drawers and on the opposite side seating for three. This island has been left deliberately clear to allow a large area for food prep as well as a serving area for large parties so that guests can help themselves. On the other side of the island is a run of tall cabinetry including the Gaggenau French door fridge freezer which is positioned centrally. 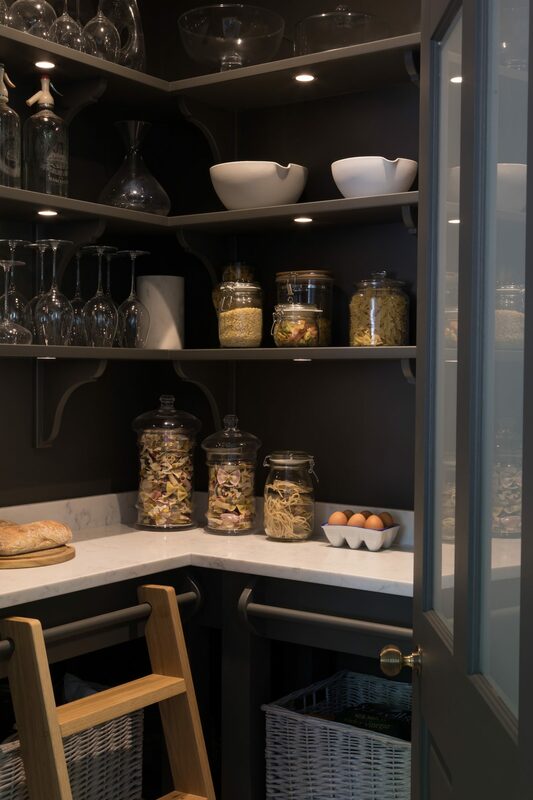 To the left of the Gaggenau is a large crockery cupboard and to the right is a day pantry to ensure everyday store cupboard ingredients are nearby for those speedy mid-week suppers and within easy reach of the island. The sink run sits underneath two large Georgian sash windows that look out across the beautifully landscaped gardens. A set of three drawers provides masses of storage for cookware and bakeware. The top drawer is perfect for storing utensils, the two beneath are larger and designed to store pots and pans. Directly beneath the sink is a hidden drop down sink trough which is perfect for storing away anything that could unnecessarily clutter the sink area, for example damp clothes, gloves etc. Just to the left of the sink is an integrated Miele dishwasher so that plates can be easily cleared away after dinner (the sink also contains a waste disposal unit). 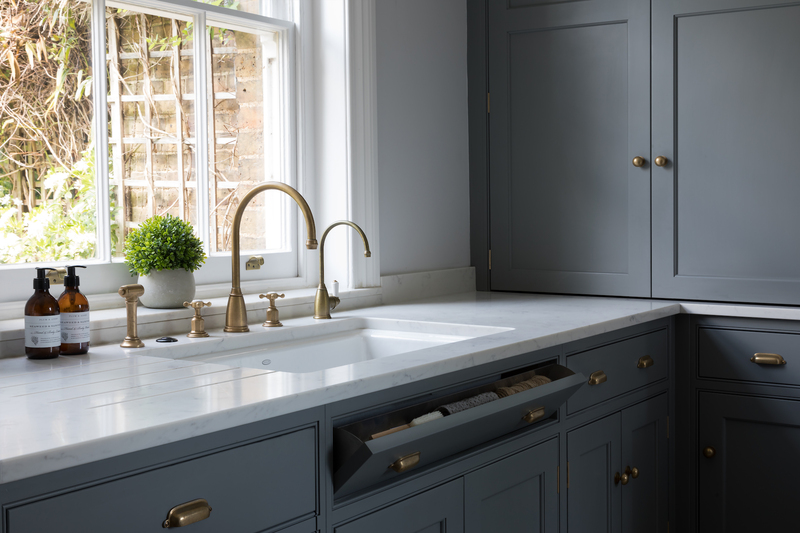 The sink itself is a Kohler Deerfield smart divide with a Perrin & Rowe Athenian tap and rinse and a Perrin & Rowe Parthian hot tap, all finished in aged brass to compliment the cabinetry hardware. Situated in the alcove to the left hand side of the chimney, is the countertop cupboard with bi-fold door which our clients use as a breakfast and appliance cupboard. The bi-fold door conceals the toaster and free-standing microwave and the large shelves above provide plenty of space for cups, glasses and drinks. The drawer below provides easy access to cutlery, and the Gaggenau under-counter refrigerator on the island behind provides immediate access to milk and butter making breakfast a quick and seamless affair. The dining area is located just off of the main kitchen with a bespoke walk-in pantry tucked away in a previously unused recess. Guests can sit in within earshot of their hosts preparing food whilst food and drinks can be taken from the pantry without interrupting people at the table. The extra large glass globe pendant is finished in aged brass, and the vintage artwork on the wall behind gives this space its own identity. Hidden behind a Georgian style glazed door and next to the dining area is the walk-in pantry. The Georgian style door has frosted panes so that this space can be kept hidden from view. 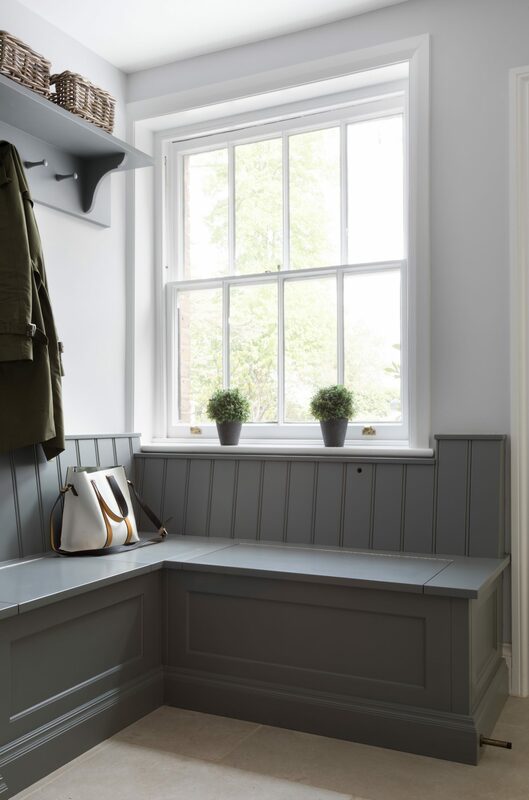 This perfectly sized space has artisan shelves to the ceiling which maximise storage space and to help reach the highest spaces is a natural oak ladder which can easily be moved along the bespoke ladder rail. The warmth of the natural oak ladder contrasts perfectly against H|M’s Top Hat colour which was chosen for continuity between the kitchen and pantry as this is also the colour on the kitchen island. 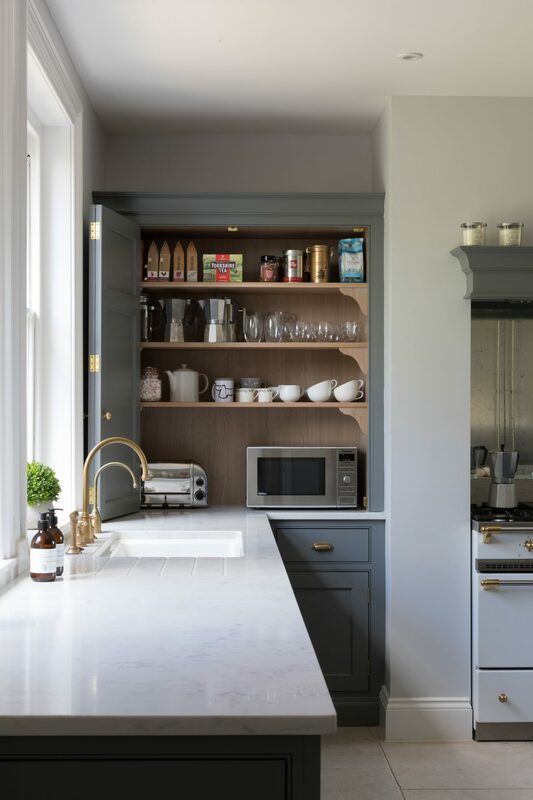 The quartz worktop sits beneath the artisan shelves, allowing for extra prep space along with pantry table shelving below for baskets and hampers. Just off the main kitchen is the utility / boot room which provides the everyday entrance to this end of the house. This light and airy utilitarian space is designed with ease of use in mind. Little Otto is the star of the show here – we loved this photo so much! 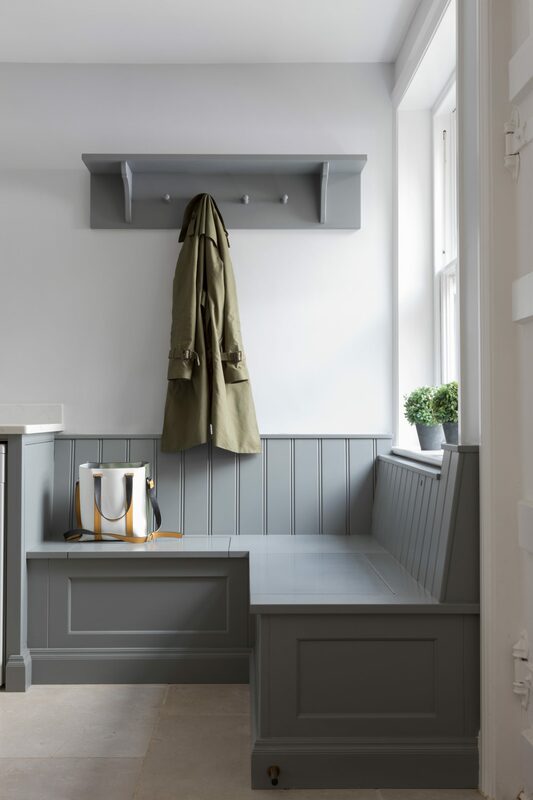 The bench seating has lift up lid storage for boots and bags and above is another artisan shelf with coat hooks to balance the space and provide yet more useful storage. One of the boards has a hole cut out – this is to provide quick access when required to the water stopcock located behind. This is a fully functional utility room so it’s about substance as much as style. 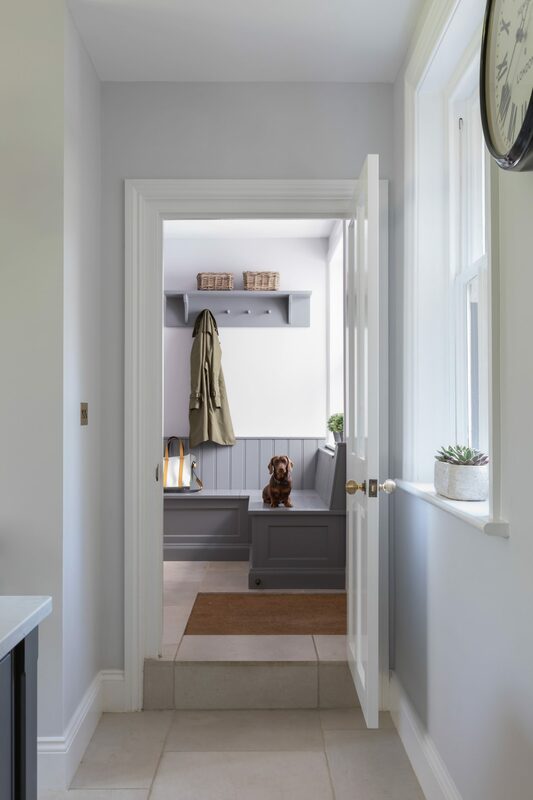 The sink run, which has been finished in H|M Windward, starts at the far end of the room where you will find coat hooks beneath an artisan shelf and the same again much lower which is used for storing dog food. 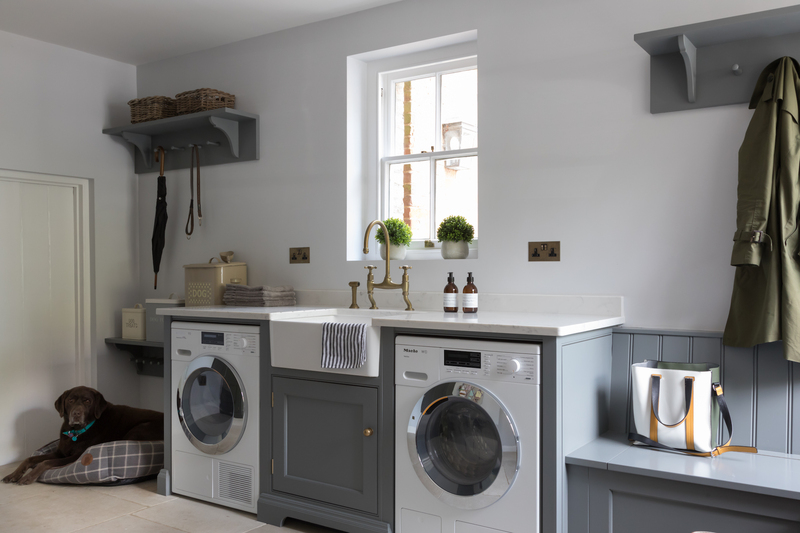 Sitting underneath the counter either side of the butler sink is a Miele washing machine and Miele tumble dryer specified for their durability and reliability. 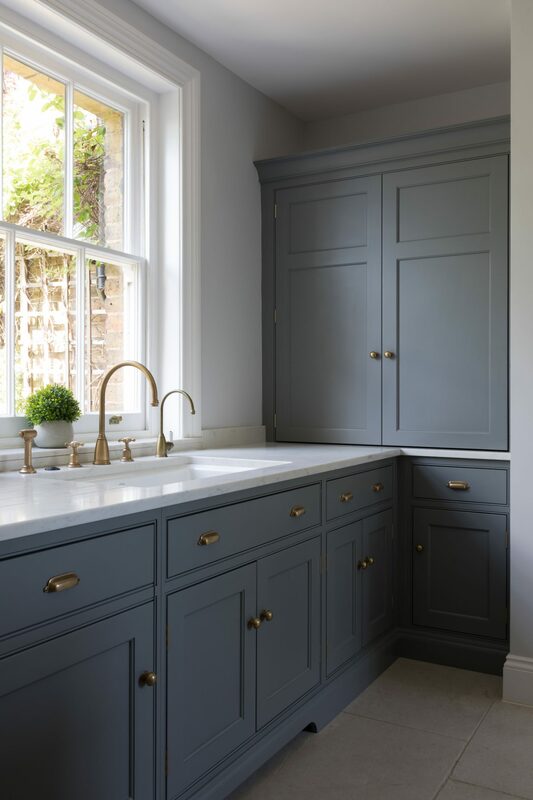 The Nickleby cabinetry is also painted in the same Windward paint as the kitchen, while the Perrin & Rowe Ionian tap and rinse are also finished in aged brass for continuity. 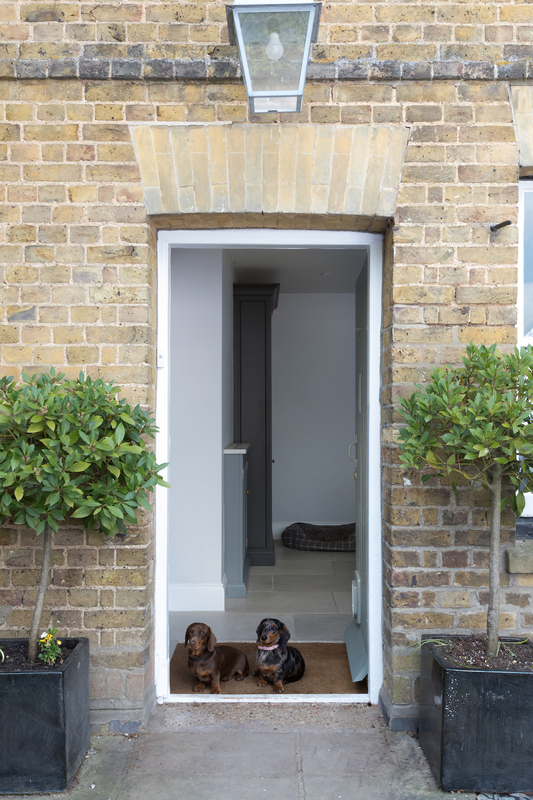 If you look past the cute pooches (Otto + Mitzy) in the photo above you can just see that opposite the sink run is a large tall Nickleby cupboard finished in H|M Top Hat and is designed to store coats and clothing out of the main boot room. There is also Nickleby cabinetry built into the fireplace with doors that open to reveal additional shelving space for things like batteries, torches and other utility items. 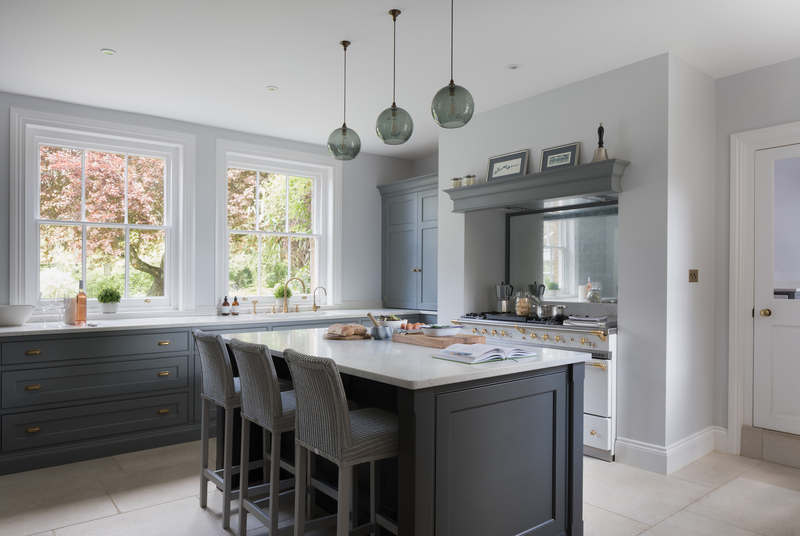 We hope you’ve enjoyed this tour of the Old Vicarage project, to see more of this Humphrey Munson kitchen project please click here.